ALICE IN CHAINS is preparing to enter the studio to begin recording its new album for a tentative late 2017 or early 2018 release. Speaking to Good Celebrity on May 1 at the tenth-anniversary George Lopez Celebrity Golf Classic at Lakeside Country Club in Toluca Lake, California, ALICE IN CHAINS guitarist Jerry Cantrell stated about the band's plans for the long-awaited follow-up to 2013's "The Devil Put Dinosaurs Here" (see video below): "We are just gearing up to make a record. We'll be moving up to Seattle in about a month and record the record over the summer out there in the same studio we recorded our third record in. So it'll be kind of fun — go home, make a Seattle record. Hometown boys in a hometown studio." Asked if ALICE IN CHAINS will "keep it a little grungy" on the next disc, Cantrell said: "Hey, this is what we do. At this age, I can't really do much else. So we do us, and we're lucky enough to be able to have the opportunity to still be doing it and making good music and having a good time." 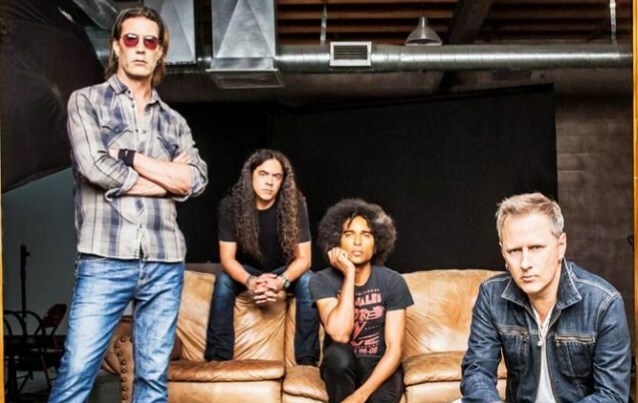 DuVall told the Phoenix New Times last year that ALICE IN CHAINS was in a fortunate position to be able to keep touring without any new material. "[We are] lucky enough to have the kind of fans that will show up regardless, and there is obviously never any shortage of songs to play," he said.